Your home is one of your most valuable assets. We will make sure you have the protection you need. We want to help you choose the right coverage and limits for your auto before you have that claim. You know your business well. It is our job to help you with your insurance needs so you can spend your time at what you do best. 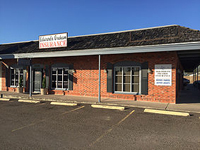 Edwards-Graham Insurance Agency is an independent insurance agency. We don't just represent one insurance company with just one option for you. We have contracts with over a dozen top-rated insurance carriers so that we can find the right coverage for our customers. You call us and we can do the shopping for you!